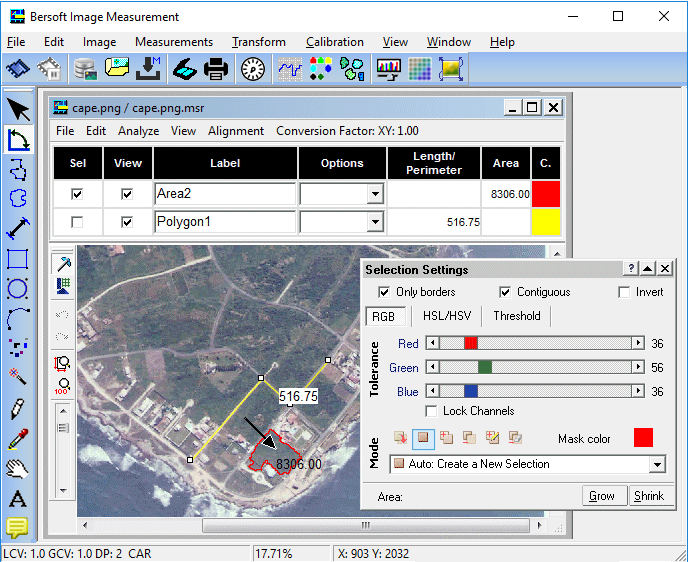 Description: Bersoft Image Measurement is intended for measuring and analyzing digital images. Measurements are done by pointing and clicking, using angle, distance, perimeter, area, point and line measurement tools or in an automated way, when calculating statistics and object finding. Supports image acquisition from TWAIN devices and many different types of images, including DICOM files. Now includes an image Database. Description: Generating NC code for CNC pipe beveling machine with easy and convenient. Supporting the CNC beveling machine which contains 2 bite tools for inside and out side machining. 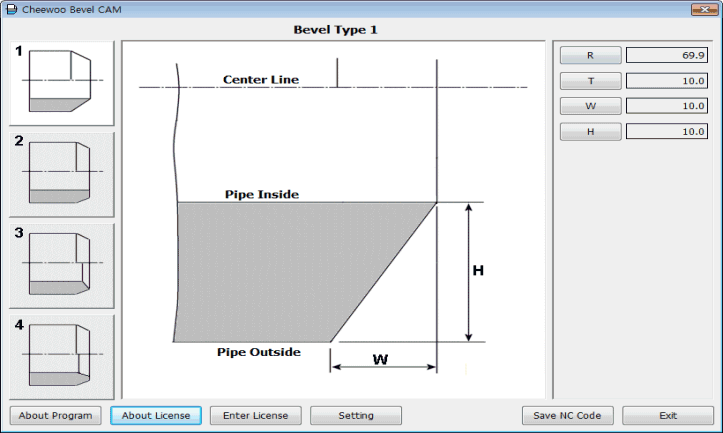 Contains 4 types of pre-defined bevel shape template for easy and fast parameter input process. Contains best pre-defined tool paths to make bevel cutting process smooth and fast for increasing productivity. Requires Windows 2000 or above, RAM512 MB,10MB HDD or above. Description: All-in-one CAM for CNC pipe cutting + sheet cutting machine. 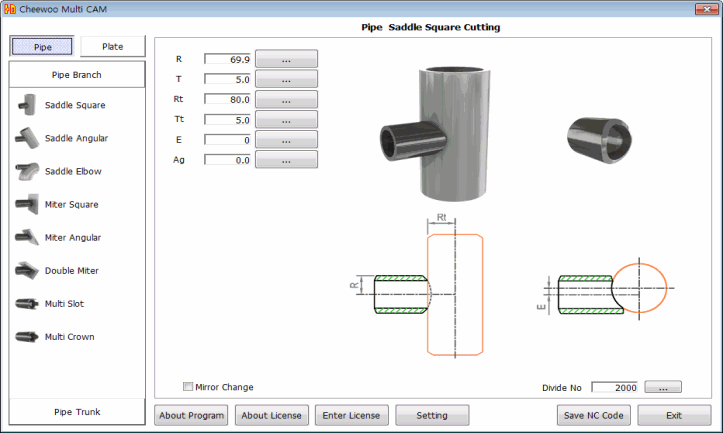 Contains various pipe cut model and sheet cut model templates for easy and fast geometrical input process. Supporting essential NC parameter setting for matching CNC controller. Requires Windows 2000 or above, RAM512 MB,10MB HDD or above. 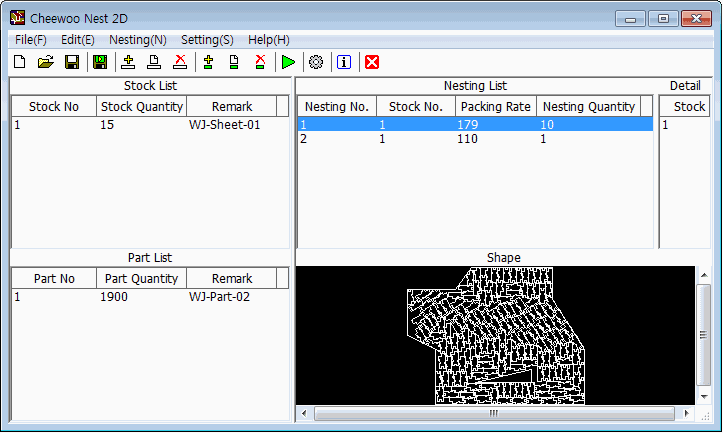 Description: Performing 2D automatic true shape part nesting using advanced nesting engine. Several levels of packing rate can be selectable. Packing direction and minimum distance in between parts are also adjustable. Able to nest multiple stocks an parts. 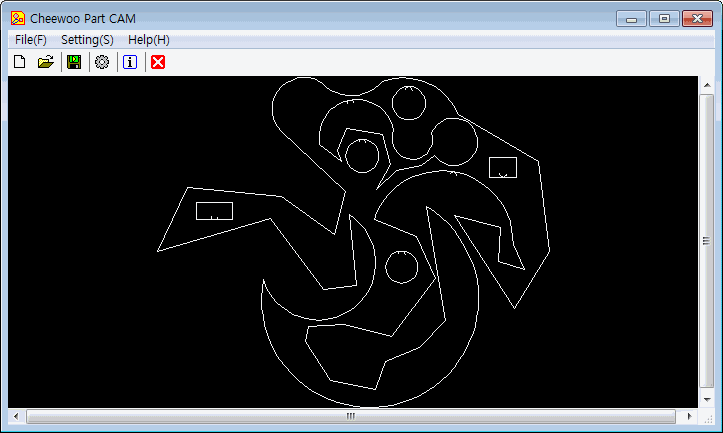 Using industrial standard DXF formatted file as a stock / part shape definition input file. Able to gain maximum stock saving and high speed estimation for daily nesting jobs. Description: Converting single 2D part shape defined DXF file into single CNC part program code for 2 axis CNC cutting machine. Recognizing outline and/or hole from part shape during DXF part shape definition file reading. Automatically generating round shape lead in / lead out line in a optimal position. User can set round size. Generating CNC part program code for plasma / laser / knife cutting / water jet etc. 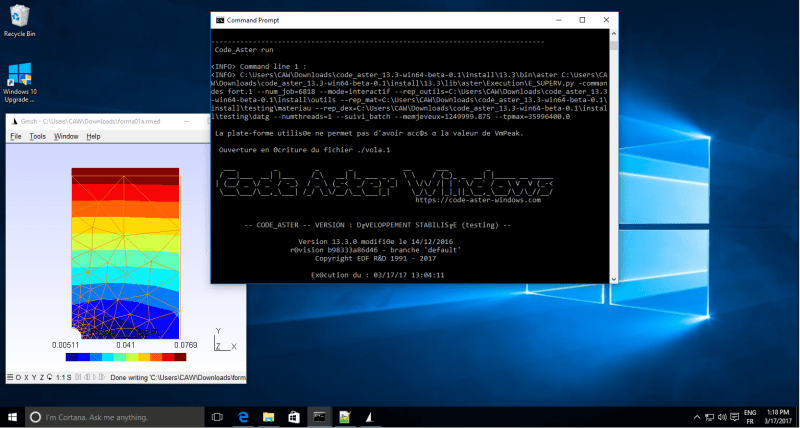 User can set G code, M code, argument code. 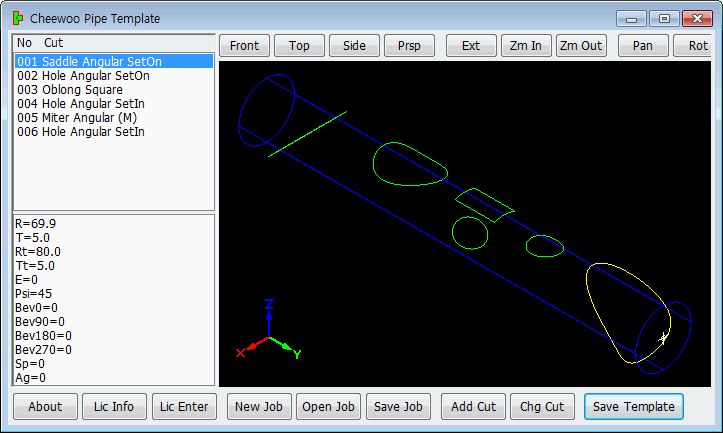 Description: Generate NC code for CNC pipe profile cutting machine using 3D templates and simple parameter inputs. 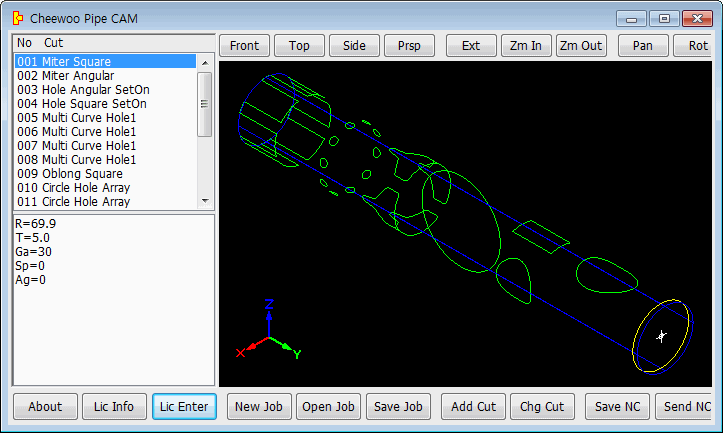 Complex 3D cutting path can be built adding various 3D cut models and checked in path window. Cutting path is calculated by our own developed mathematical equations without external program / CAD support. Requires Windows 2000 or above, RAM512 MB,10MB HDD or above. Description: Generate pipe cutting template pattern for manual 3D pipe profile cutting job. Complex template can be generated by using simple parametric input method. Current state can be saved as a job file, and also add any job file into current state to make new job. Requires Windows 2000 or above, RAM512 MB,10MB HDD or above. Description: Generating NC code of the probe/tool path covering the free shape surface for 5-Axis CNC inspector/machine. Generating 3D free surface automatically by using reference point data. 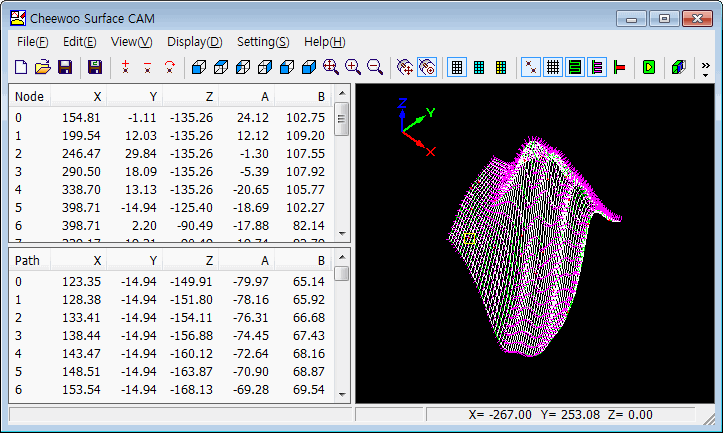 Contains section view feature to check 3D surface acceptability. Requires Windows 2000 or above, RAM512 MB,10MB HDD or above. 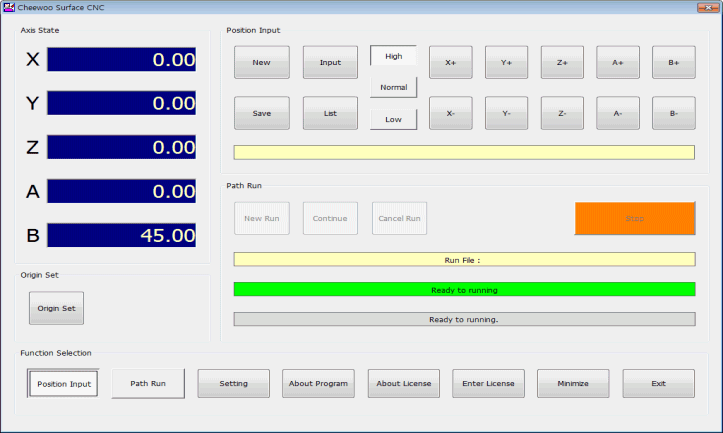 Description: Making 5 Axis CNC controller by combining this software, PC and TURBO PMAC CLIPPER controller. The CNC made by Cheewoo Surface CNC is perfectly working with Cheewoo Surface CAM program. The CNC made by Cheewoo Surface CNC fully support position, velocity, feed speed display and alarm. Requires Windows 2000 and above, PC hardware and TURBO PMAC CLIPPER motion controller hardware. Description: Code_Aster is a finite element solver (similar to Nastran, Abaqus, Ansys, ...) and it solve different types of mechanical, thermal, acoustic, seismic, problems. It can be used for simulation in thermo - hydro - mechanics and calculation of structures.